The weather was not great - no clouds during the first 40mins of imaging, then they rolled in and never cleared until morning. 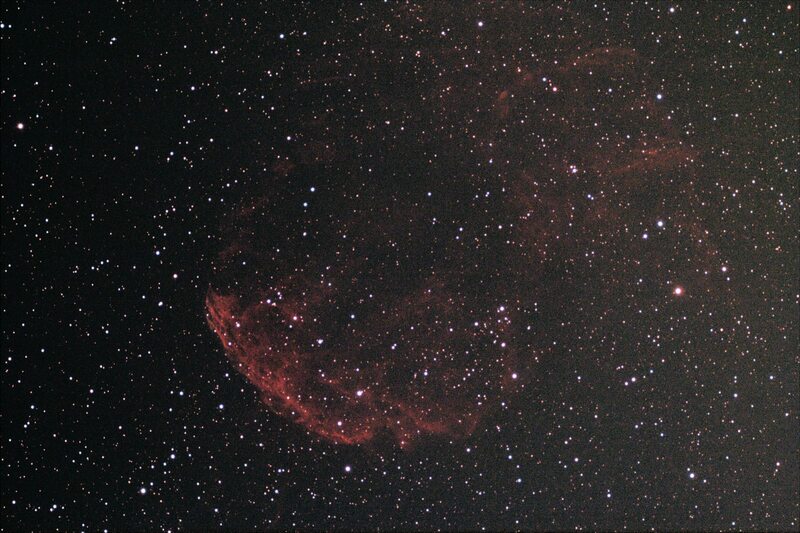 My first attempt at this nebula. I will need to target i again to reduce the noise. I did have time to capture 50 dark frames at the correct ambient temperature. Some of my previous images have suffered from a directional line-like noise. It has been suggested that this is caused by improperly calibrated darks. So here I set to test this by taking proper darks. After processing, the image is noisy - but this is not directional, meaning the darks worked and I just need more frames. There is also a strong gradient in this image, not sure what from but I tend to get this when imaging targets at low altitudes. Tonight is predicted to be clear...another chance for more data!